I stumbled across fellow co-worker student Dan this morning on my ride in. Dan has really taken to bicycle commuting this summer, riding practically every day! 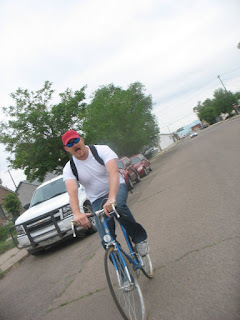 The warmer weather, having other co-workers participating in the Pueblo Bicycle Commuter Cup, rising gas prices, a limping truck, and a desire for some good old fashioned healthy living, have all played a part in his bicycle revolution.